This winning combo makes a delicious first food to start your little one on a lifetime of culinary adventures! For a smoother mixture: Place in blender and puree, slowly adding liquid until desired consistency is reached. For infants: Add liquid of choice to reach desired consistency based on age and caregiver’s comfort level. Nutritional information will vary. For older babies and toddlers: Serve in reusable baby food pouches for maximum portability, or freeze in ice pop trays to make homemade popsicles. In a bowl, mash carrots, white beans and avocado until smooth. I can think of a number of ways to enjoy this spread! 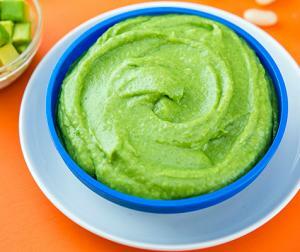 We're so glad you shared this healthy and delicious Avocado, White Bean and Spinach Baby and Toddler Food recipe on the Healthy, Happy, Green and Natural Party Blog Hop. I'm Pinning and sharing!